I will be heard as I kneel. In “(Re-)Documenting the Black Body in America,” my printed “provocation” in Theatre Journal’s December 2018 special issue on Post-Fact Performance, I reflect on raising my black son in America. There, I investigate the (un)documentation of black bodies in America and discuss the duty to find solutions as to how to address systemic racism on black bodies in a post-fact society. As part of this solution-finding drive, I created The Absence of the Other Flesh: The Dismissal of the Black Body in America, a dance for film project that shows how gestures of resistance exist in America. Through structures representing power, and images that reflect the deaths of black bodies murdered by police, I aim to show the joy, pain, intellect, and consequence of being black in America. This film was partly inspired by the Colin Kaepernick controversy, which I discuss below. In 2016, Kaepernick, a US football player, disrupted hegemonic norms in the National Football League (NFL) by making the black body visible for social justice by kneeling during the national anthem.1 Although silent in his verbal communication, Kaepernick’s bodily protest allowed for a tempest to arise. His body created black optimism for another passage to black liberation in America. There is little or no acknowledgment of the intellectual black body in an organization, such as the NFL, that uses the black body for financial gain and documents the black body regularly when it is providing a service. The NFL uses data analytics to document bodies in motion in order to be competitive in the arena of football. However, those same bodies cannot get documented when they move for equality and social change. Figure 1. 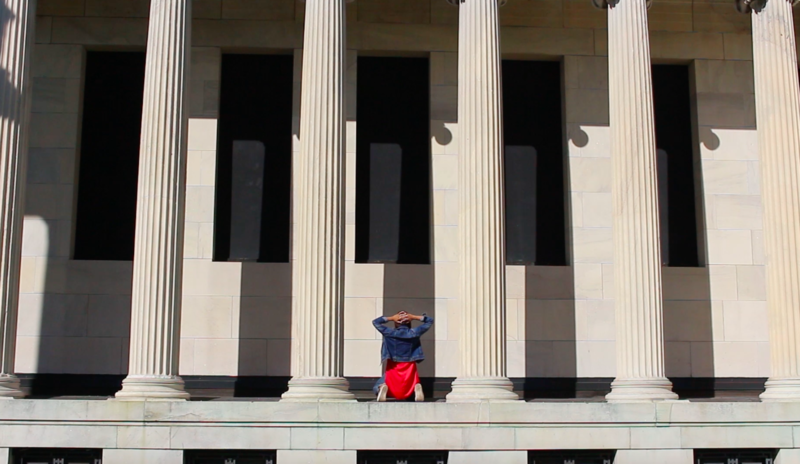 Still from Naila Ansari’s film The Absence of the Other Flesh: The Dismissal of the Black Body in America (2018). Standing for the national anthem is a customary gesture of “patriotic” pride, especially for football players and other sportspeople. However, to stand for justice through the act of kneeling while a national anthem is being played suggests and performs the act of being treated like an Other. This gesture highlights how Americans become defined by binaries, such as patriot versus enemy and present versus absent. The poles in these binaries are separated in this case only by the act of kneeling. The body speaks louder than any word, complicating power and privilege. When gestures such as this are used to express injustice, the black body becomes an enemy of the state. In May 2018, the NFL created a new policy rejecting the black body in protest. The league’s commissioner, Roger Goodell, announced that “the NFL will enact a national anthem policy for 2018 that requires players and league personnel on the sideline to stand, but gives them the option to remain in the locker room if they don’t want to stand.”2 This statement effectively resulted in the dismissal of the black body, and in the silencing of the identity and memory that has historically plagued people of color in America. To have the black body absent in the public arena of football is to remind America that the black body is an Other, that it is good only for labor that produces and reproduces capitalist ideals. The question then becomes: How do we document the black body in a policed space and in a post-fact society? I propose the formal documentation of gestures embodying the US national anthem. My project collects legal documentation through state legislatures and Congress that gives agency to choose how one represents America, with one’s body. Standing for the national anthem became a traditional embodied stance for “all.” However, tradition is a hierarchical practice managed by those in power, and, following the colonization of America, traditional stances toward the national anthem have been imposed upon, and have excluded, oppressed subjective positions. I understand the body as representing the inscriptions of memories and ancestral lineages that continue through movement pathologies of race and culture. To grasp how memory pertains to pathology, I see to French historian Pierre Nora’s notion of “true memory,” which he defines as “gestures and habits, in skills passed down by unspoken traditions, in the body’s inherent self-knowledge, in unstudied reflexes and ingrained memories.”3 Gestures of resistance are inscriptions of memories and cultural legacies, which I suggest are the catalysts of change and reproductions of new understandings. These re-creations of understandings can become the impetus for social justice among marginalized communities. Kaepernick’s kneeling gesture reflects movement kinesthetically, but also culturally, as fighting for equality. Movement inscriptions are truths that mold the identities of race in America. The body becomes a living history of gestures that inform future generations, that take the movements of their ancestors and evolve them in the present and future. The pathology of the black body in America is violent, vicious, and inhumane, but through all of the pain the body finds a way to move. Kaepernick’s kneeling is an example of the oppressed black body moving despite the daily police brutality placed on black bodies. His kneeling is both a revolt and a release that brings awareness around the marginalization of people of color in America. The flesh in which the black body in America exists represents the lineage of pain and joy that has affected and continues to affect black communities. To have this flesh absent from the present is to keep the black body as an Other. Kaepernick used kneeling to represent the history of pain and brutality against blacks in America. His movement, I argue, is the kind of protest that allows for change to liberate the black body in America. Regardless of pain and systemic racism placed on people of color, it is the body that allows for both revolt and joy to exist simultaneously, releasing pain into a state of liberation. Paradoxically, the NFL’s dismissal of Kaepernick’s body was not a failure, but a success. His protest was successful in showing that the black body is so powerful when “present,” and that its absence is what can give rise to change. 1 For a more detailed description of Kaepernick’s protest in 2016, see Billy Witz, “This Time, Colin Kaepernick Takes a Stand by Kneeling,” New York Times, January 20, 2018, available at www.nytimes.com/2016/09/02/sports/football/colin-kaepernick-kneels-national-anthem-protest.html. 2 For the full policy and statement from NFL commissioner Roger Goodell, see Austin Knoblauch, “NFL Owners Approve National Anthem Policy for 2018,” available at http://www.nfl.com/news/story/0ap3000000933971/article/nfl-owners-approve-national-anthem-policy-for-2018. 3 Pierre Nora, “Between Memory and History: Les Lieux De Mémoire.” Representations 26 (spring 1989): 7–24, quote on 13. Naila Ansari is a graduate of Point Park University’s Conservatory of Performing Arts dance program. She is an Adjunct Professor of Dance at SUNY Buffalo State College. Currently, Ms. Ansari is in her second year of the MFA Dance program at the University at Buffalo. Her most recent work 'Mine Eyes Have Seen' was selected for the 2018 American College Dance Association's National Festival held at the John F. Kennedy Center for the Performing Arts in Washington, D.C. Her research focuses on using archival materials to explore gestures of resistance from historical moments in time that changed America.